Recently, I had the pleasure of going to Las Vegas. When I say that, folks often give me this confused look that lands somewhere between mild curiosity and getting smacked with a rogue fart. To be clear, I don’t gamble and I hear (and now know) that Vegas is a much more enjoyable when you aren’t loosing all of your cash. Personally, I was there to get lost, a bit dusty, and explore the natural areas southwest a bit more. I couldn’t do that on the Strip–a 4 mile, golden-leafed paradise for the rich, the poor, and a fleet of noisy airplanes and zombified gamblers. For that I had to go to the desert…part of the desert. Head 15 miles or so west of Vegas down I-159 and through the scenic Charleston exit past the stuccoed Summerlin suburb and you’ll hit Red Rock Canyon–a national conservation that contains a vast and diverse collection of collosal rock formations, flora, fauna, and rich hippies. The exit before the official conservation is the Calico Basin which is free and as stunning in comparison to more crowded conservation space. It’s quiet there and you won’t have any cell phone reception so that also means this isn’t an Uber trip. You might even have to have an actual conversation with some of the locals and a handful of ambitious visitors. Watch out for the power-bikers when you’re texting and driving. Obstacles aside, It’s well worth your time in comparison to the time that you’ll spend overpaying for weak drinks and drooling over how many Gucci and Balenciaga stores developers can pack into a dense, yet relatively small retail/gambling district. When you hit Red Rock you’ll notice that the terrain is littered various shrubs and a spectrum of colossal rock faces that range from crumpled terracotta hills to iPhone, “Space Gray” mountains. In the same field of view, I saw open sky, an assortment of moody clouds shuffling about, and a rain storm on the cerulean horizon of mountains to far to climb, to muted to name. If you watched the old Bear Gryllis Man vs. Wild episodes with him eating and drinking unspeakables near your local interstates, you have a paranoia about walking in the desert for the inevitable rattlesnake to strike at your unguarded ankles through your Tom’s loafers and obnoxious and unseasonable “The North Face” vest-thing. I’m here to tell you that it isn’t…quite true. While there are snakes here, there aren’t as many as tried to avoid. I found myself jumping far too often over grounded twigs and twisted brush. I’m no Bear Gryllis but in my defense, Bear Gryllis might not be “Bear Gryllis”. When you’re between the canyon, the air, no everything, is noticeably clearer. The quiet is more present and immediate and you’re able to feel how very small you are in comparison to the formations in front of you. They’ll occupy your eyes and spirit completely without compromise. Over the course of two days, I was able get an assortment of shots that I’m reasonably satisfied with. I hope to get more. 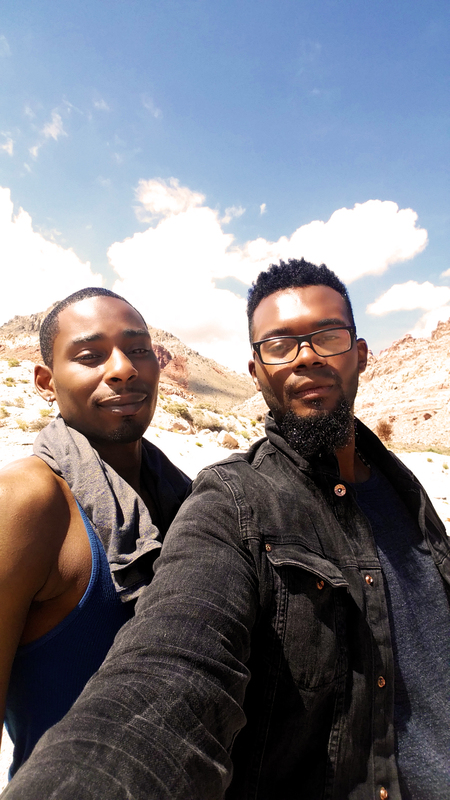 If you’d like to check more of what I saw on my in my time at Red Rock Canyon, feel free to visit my newest portfolio of nature shots and one pretentious selfie with my homie at Red Rock Canyon. Enjoy!